Bank of England to the rescue? The dire economic warnings that preceded the UK’s vote on whether to exit the European Union were dismissed by supporters of “Brexit” as part of a shadowy conspiracy they dubbed “Project Fear.” But data released since the vote to leave the EU paints a frightening picture of the UK’s economic prospects. A gauge of UK manufacturing activity dropped to its lowest level (pdf) in more than three years, Markit Economics said this week. 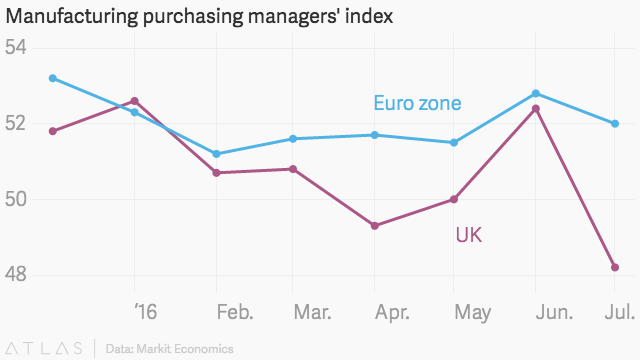 The purchasing managers’ index reading of 48.2 for July suggests the industry is contracting—any reading below 50 is consistent with contraction—while in the euro zone manufacturing activity is still growing. The most recent survey of purchasing managers in the services industry, which makes up 80% of the UK economy, was equally gloomy. Together, these reports suggest that we might not see much, if any, GDP growth in the UK for the rest of this year. It gets worse. Bank lending to businesses is forecast to shrink 1% this year and nearly 2% in 2017, according to a new report by consultancy EY. Business confidence dropped “drastically” in another recent survey released by an accountancy association. A majority of chief financial officers surveyed by Deloitte said they planned to reduce capital spending and hiring because of Brexit. GfK’s consumer-confidence index registered an 11-point drop in July, the sharpest monthly decline in more than 26 years. In the markets, investors have amassed the biggest bets against the value of the pound in 25 years. The Bank of England has the task of steadying the ship. Policymakers are widely expected to cut interest rates on Thursday to the lowest level in the central bank’s 300-year history. 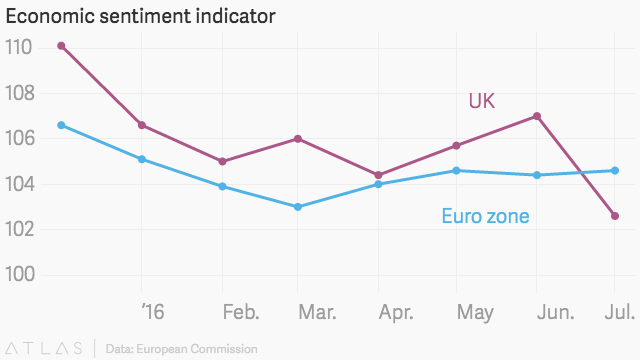 Even with this stimulus, Scotiabank recently revised its outlook for the UK to a mild recession in the next few quarters, with forecast GDP growth in 2017 of zero, down from a 2% expectation before.